Drink this tea for the joyful taste, and enjoy the health benefits. Pennywort is served in Thai restaurant as a cooling drink, and along with hibiscus works to improve circulation and tone the veins. Lemongrass and a hint of clove complete the flavor combination. 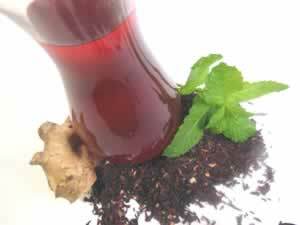 Recipe Instructions: Herbal Tea :Use 1 tablespoon of herbal blend to each cup of heated water. Infuse about 10 to 15 minutes, or until cool enough to drink. 2 to 3 cups a day.